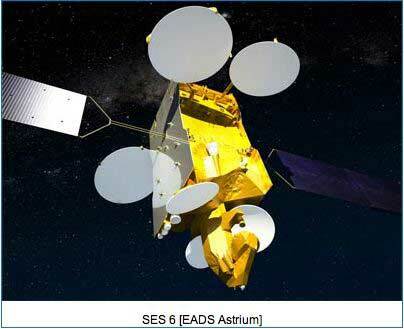 [SatNews] SES WORLD SKIES, a division of SES S.A. (Euronext Paris and Luxembourg Stock Exchange: SESG), has signed an agreement with Astrium, a wholly-owned subsidiary of EADS (Euronext Paris: EAD), for the procurement of a new satellite to be named SES-6. Consistent with its approach at other orbital locations, the deployment of SES-6 to 319.5 degrees East will meaningfully enhance a core SES video neighborhood while allowing NSS-806, the satellite currently at that location, to be relocated for other missions. The 319.5 degrees East slot is home to one of the largest cable communities in Latin America, supporting video distribution including HD content to more than 5,000 cable head-ends serving some 18 million homes for key broadcasters such as Fox, Disney ESPN, and MGM. SES-6 will offer 50 percent more C-band capacity for the cable community and retain the unique capability to distribute content between the Americas and Europe on the same high powered beam. In addition, SES-6 will offer a substantial upgrade to Ku-band capacity in the region with dedicated high power beams over Brazil, the Southern Cone, the Andean region, North America, Mexico, Central America and the Caribbean, while also offering an innovative payload to support mobile maritime and aeronautical services on the highly demanded routes from North America, the Gulf of Mexico, across the north Atlantic and to Europe. With 43 C- and 48 Ku-band 36 MHz equivalent transponders (38 C-Band and 36 Ku-Band physical transponders) the 6,000 kilogram satellite is expected to be launched in early 2013 and will have a design life of 15 years. This satellite will be built on a Eurostar E3000 platform, the latest version of Astrium’s Eurostar series which has proven to be highly reliable in commercial service. More than 60 Eurostar satellites have been ordered to date. SES has already ordered seven Eurostar E3000s: ASTRA 1M, which entered into service in 2008; ASTRA 3B, which is scheduled for launch in late May, ASTRA 1N, which was ordered in 2008 and expected to be delivered in early 2011, and Astra 2E, 2F, 2G and 5B, four multi-mission satellites ordered to meet the demands of the largest DTH broadcasters in Europe, and to fuel growth in Eastern Europe, Africa and the Middle East. The new SES-6 satellite, which is nearly twice as large as NSS-806, will have a total of five steerable Ku-band beams, including four beams for the Americas and one beam covering the Atlantic ocean region.